This Monique Luo for Davids Bridal is Ivory with "petals" of sheer over a shiny smooth polyester dress. It has gorgeous beading on the bodice with a tulle and organza skirt and vertical ruffles. There are no rips or tears. It has a corset back. 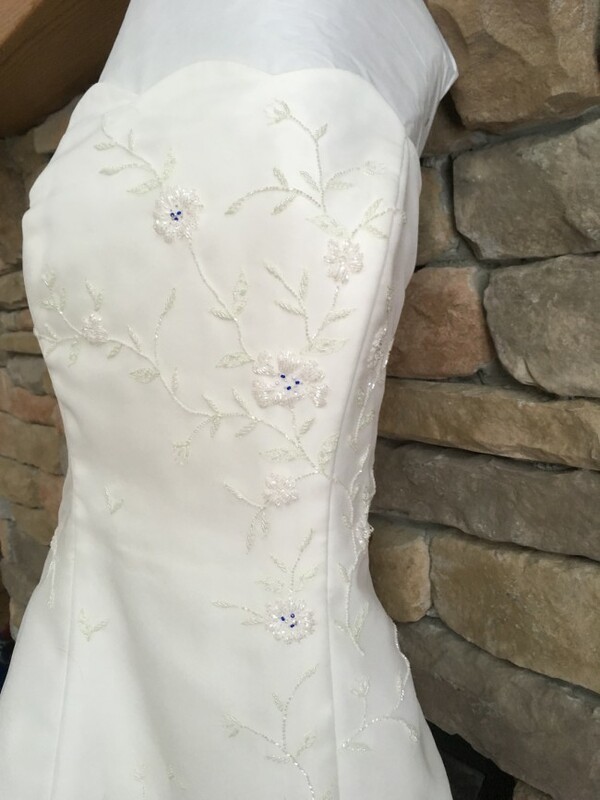 This dress retails for $1150.00, I purchased it from David's Bridal for $900. The dress is gorgeous with its detailed It has a corset back and is size 12. It does not have any rips or tears. It was worn once and was cleaned and preserved immediately after it was used. Only removed from its box to take these pictures. It is in excellent condition. It was taken in at the sides and waist to fit the bride best.